The Downtown Lincoln BID Association is an association led by a volunteer board representing six downtown business improvement districts that fund the work that keeps our downtown safe, clean and thriving. The International Downtown Association estimates that more than 1,000 business improvement districts (BIDs) currently operate throughout the United States and Canada. A BID provides enhanced improvements and activities, such as economic development, parking management, maintenance and marketing, in addition to those provided by local government. BIDs are proven to work by providing services that improve the overall viability of business districts—resulting in higher property values, occupancies and sales. Established in 1989 by downtown property and business owners, in cooperation with the Downtown Lincoln Association (DLA) and the City of Lincoln, the Downtown Lincoln Business Improvement Districts (BIDs) are special benefit assessment districts that convey special benefits to the properties located within the district boundaries. The management BIDs provide enhanced economic development, parking management, communications and advocacy programs above and beyond those provided by the City. The Maintenance BID provides landscape maintenance, daily trash removal, sidewalk cleaning and anything that ensures a clean, safe and inviting downtown. BIDs have been used successfully in downtown Lincoln since 1979, improving the district’s business climate by attracting new investment, jobs and civic improvement projects and improving the overall image of downtown. The Downtown BID includes approximately 74 blocks of downtown Lincoln bounded roughly by K, Arena Drive, Q and 17th Streets. 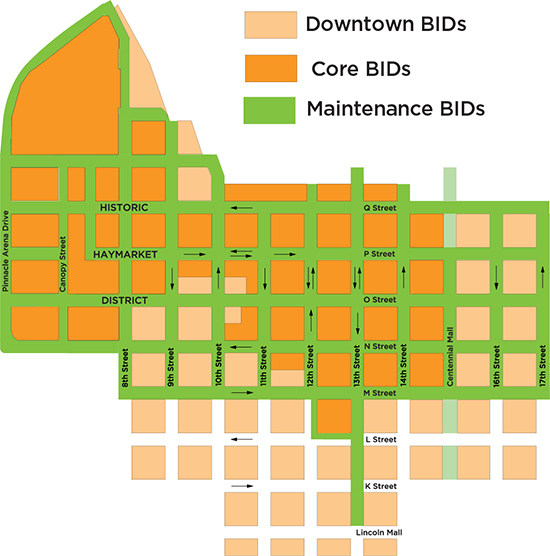 The Core BID Overlay includes approximately 44 blocks within the center of Downtown Lincoln and the Haymarket District, bounded roughly by Centennial Mall, M, Arena Drive and Q Streets. The Maintenance BID includes approximately 220 block faces of Downtown Lincoln bounded roughly by M, Arena Drive, Q and 17th Streets.